Johnstone Supply is a US leader in the distribution of HVAC repair parts. Their company is comprised of hundreds of individually owned stores all over North America. They needed a solution to allow their field techs to easily replenish their trucks after making a repair. 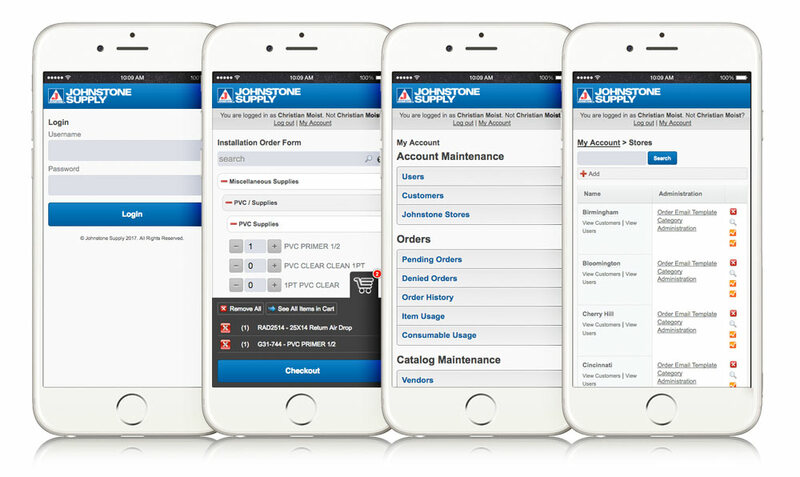 I created a robust mobile web application written in PHP to allow their techs to place orders once a repair was complete. The multi-level app served stores, customers and users. Orders were able to be routed for approval by managers, or placed directly, based on the desired configuration. Once approved, orders were sent via email to the Johnstone store’s back-end system and accepted automatically. The app was rolled out to several Johnstone stores individually at first, then reconfigured to handle all stores with one application. It’s now used for hundreds of Johnstone stores.